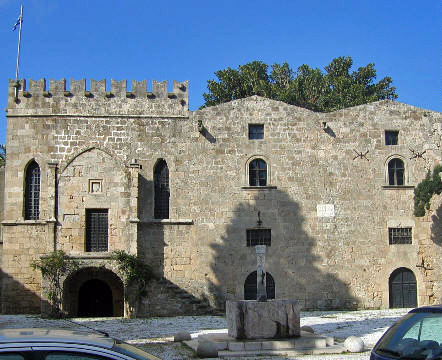 The Collachium(Kollakio) or Kastello constitutes the northern part of the medieval town , the Collachium consisted exclusively of buildings Knights (the Grand Master’s Palace , the hospitals , and hostels of different languages ​​, et cetera).. Only members of the Order were allowed to remain in the Collachium overnight. 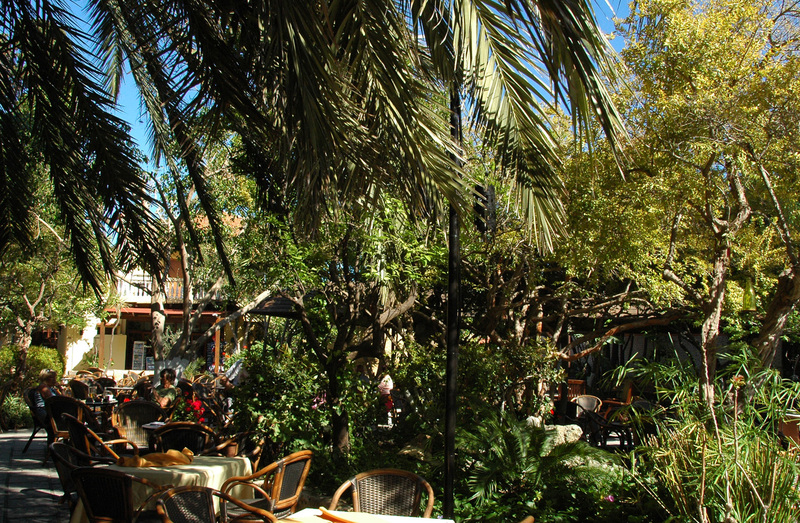 Can be undertaken Collachium visit from the place of Symi . 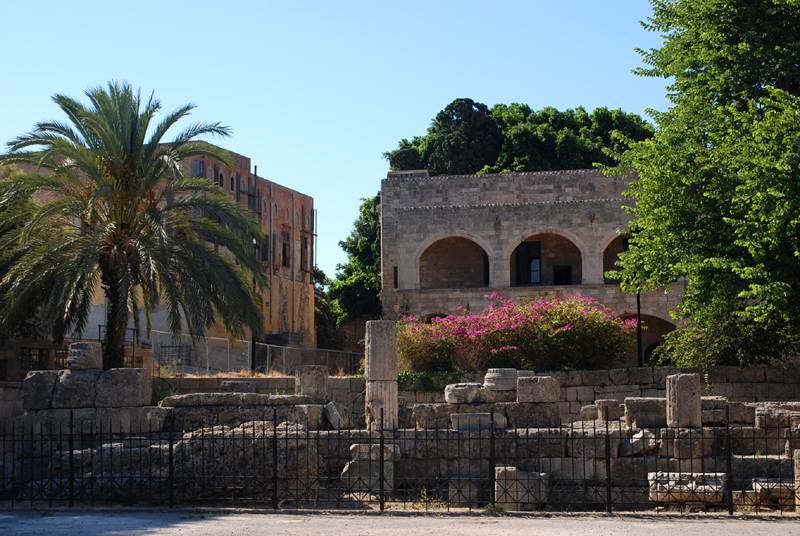 At the end of the Mandraki harbor , the place of Symi (Πλατεία Σύμης), also called Place de l’Arsenal, located at the junction of the modern city and the medieval city, between the gates of the Arsenal and the Freedom . Access to the site Symi through the door of Liberty. Behind a grid, are some remains of the temple of Aphrodite and bunch of balls that were prepared to defend the city in 1522. Beyond these remains, is the former Auberge d’Auvergne . A giant map of the old town is placed behind recent pebble mosaics. 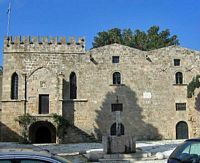 On the right of Symi Square stands a modern building built in the medieval style first floor hosts the Pinacotheca of Modern Art. On the left of Symi Square, behind a gate, you can see the foundations and some architectural elements of the temple of Aphrodite (third century BC). 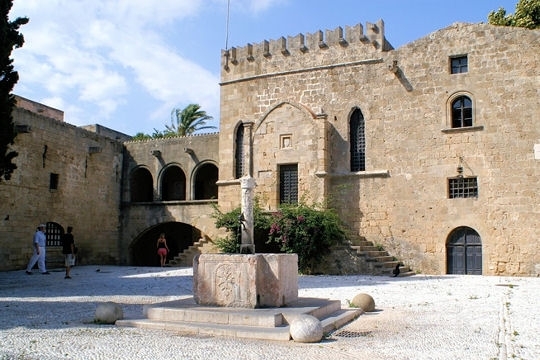 On the right of Symi Square we discover the palace of the Arsenal (Armeria), more like a fortress than a palace, built by the Knights in the fourteenth century, probably under the magisterium of Roger de Pins , which is see the crest of the building. 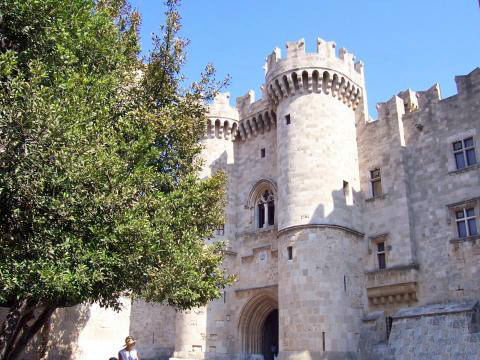 It is believed that the Knights were shipyards (the word "arsenal" is derived from the Arabic word for a shipyard). 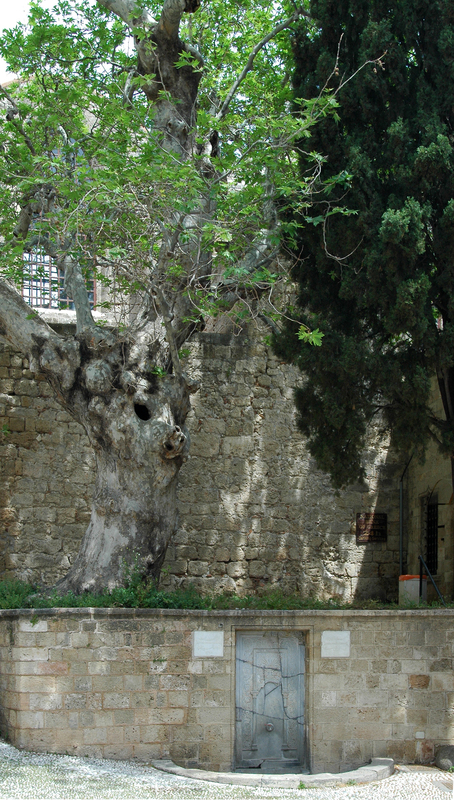 At the corner of Arsenal opens Argyrokastrou the square, with a fountain, old Byzantine baptismal font of a village on the island, placed there by the Italians. 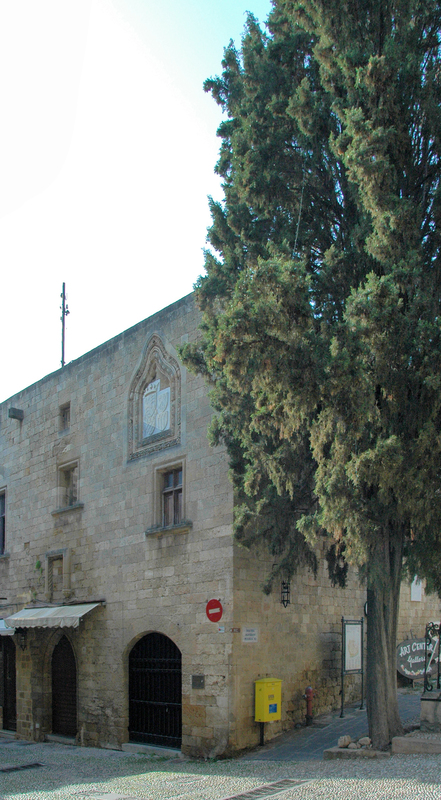 At the bottom of the square, on its west side, stands the first Hospice of the Knights . 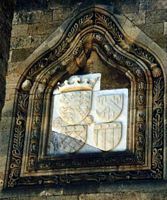 On the right side of the street from the place of Symi stands the first hospital of the Knights (fourteenth century), on its front the arms of Roger de Pins (1355-1365) in the first hospice was substituted in the fifteenth century The Great Hospital built from 1440 to 1489, on the south side of the Street of the Knights. The hospice became sick after the construction of large hospital. 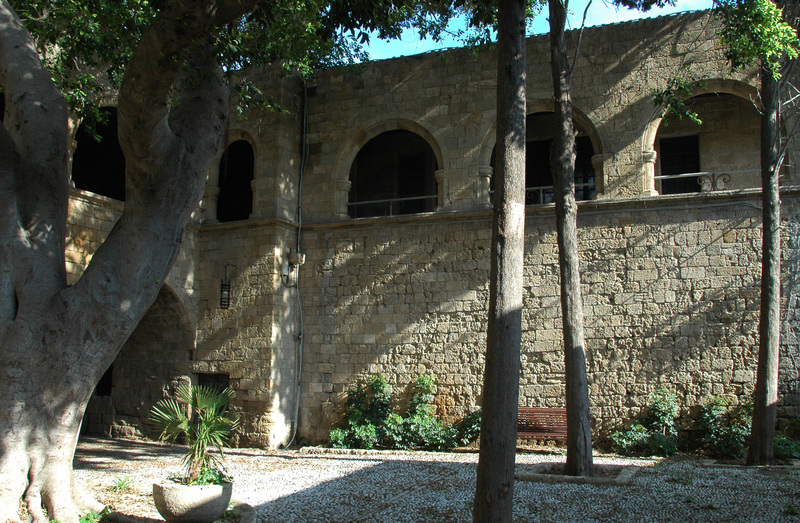 It is now the headquarters of the Greek Archaeological Service, the portal flanked by beautiful bougainvillea. 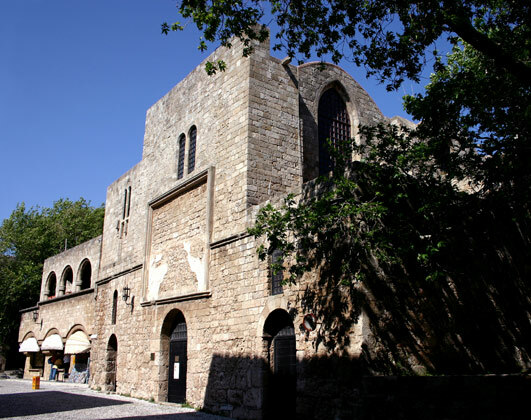 The Museum of Decorative Arts (Diakosmitiki Silogi) is housed in a vaulted building with three wings having been part of the arsenal of the Knights. The museum building long connects the hospital (formerly Hospice of the Knights) in the Auberge d’Auvergne . 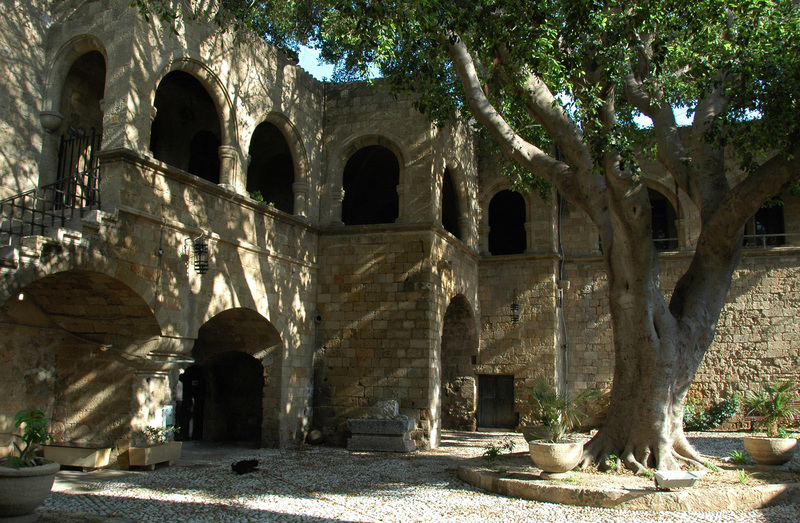 By a vaulted passage under the building, we arr i ve the small square Alexander the Great, then place the hospital. 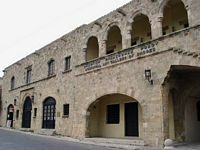 The Museum of Decorative Arts presents a collection of popular costumes and folk embroidery, furniture and ceramics from all the islands of Dodecanese , but mostly Lindos . The exhibits date from the seventeenth century to the early twentieth century. You can see a reconstruction of a traditional island house. Open every day except Monday from 8 h 30 to 14 h 30. 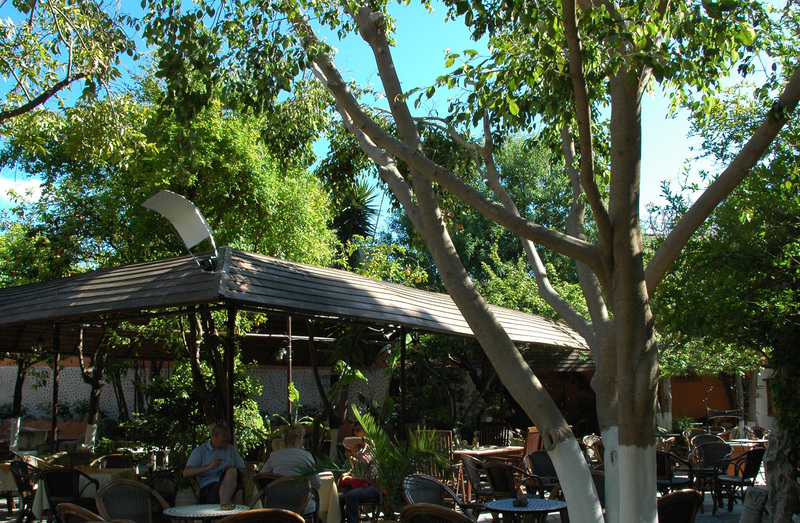 Next is the modern Greek Art gallery (every day except Sunday and Monday from 8 am to 14 pm, Friday from 17 am to 20 pm. € 3 entry with the Museum of Modern Art. 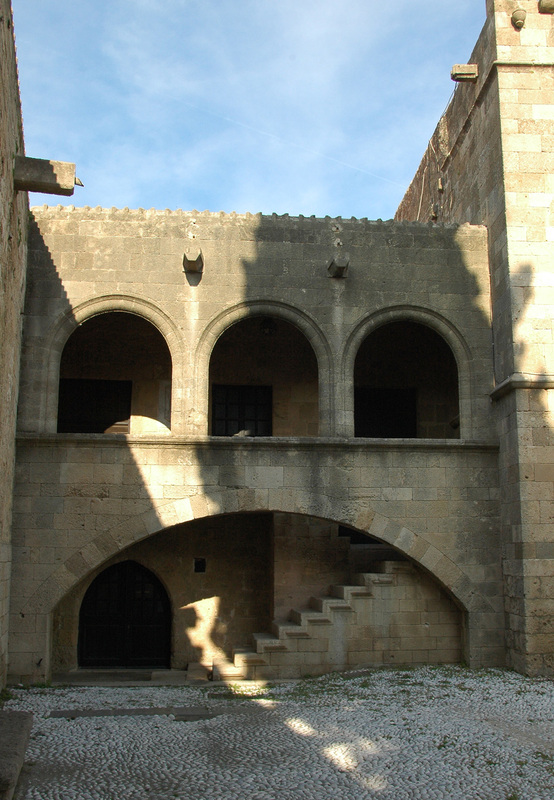 The inn of Language of Auvergne (Katalima Overnis),fourteenth century, completed in 1507, which is housed outside staircase with a covered porch on the front, stands north of Collachium, a little away from Street of the Knights. 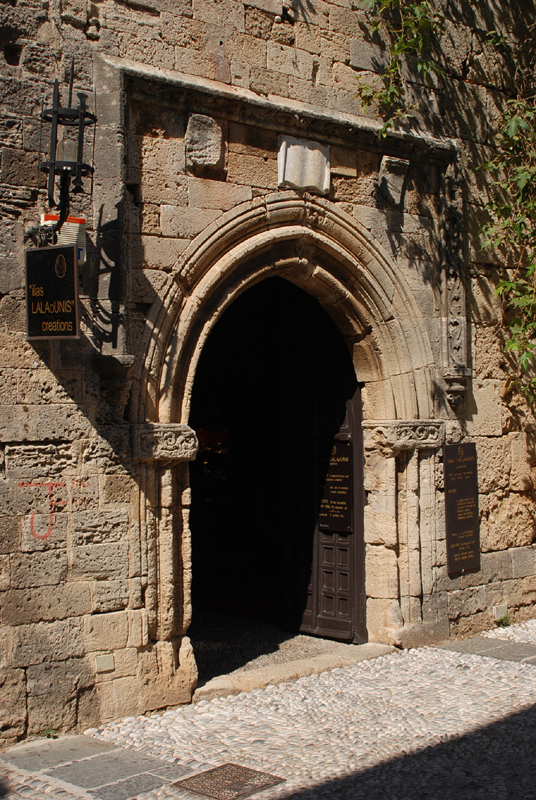 Since the establishment of the hospital, you can go to the church of St. Mary to reach the small square on Alexandrou which gives the inn of Auvergne and its Gothic door. Passing under the porch of the building below the Musée des Arts Décoratifs, we reached the place Argyrokastrou where you can see the right, the north side of the Inn. 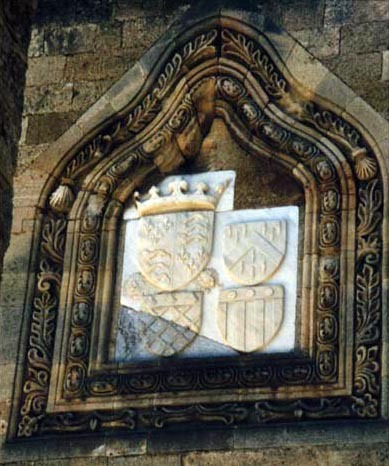 ("D’Auvergne, the Grand Prior, Brother Guy de Blanchefort"
indicating that date Blanchefort had made at its expense of restoration or expansion. At the end of the Street of the Knights , leaning against the wall behind the arch spanning the street, Sainte-Marie church, Panagia tou Kastrou (Our Lady of the Castle), twelfth century, three naves, is the setting where stands the imposing Byzantine Museum . Beautiful mosaics in the courtyard. The church of St. Mary epitomizes the history of Rhodes. 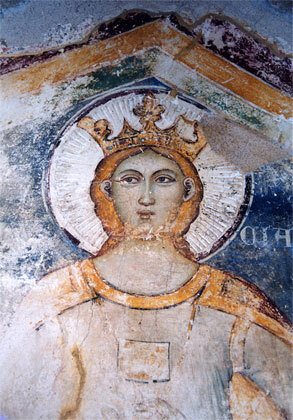 Its Gothic architecture incorporates parts and it is decorated with Byzantine frescoes (fourteenth century) and Frankish. 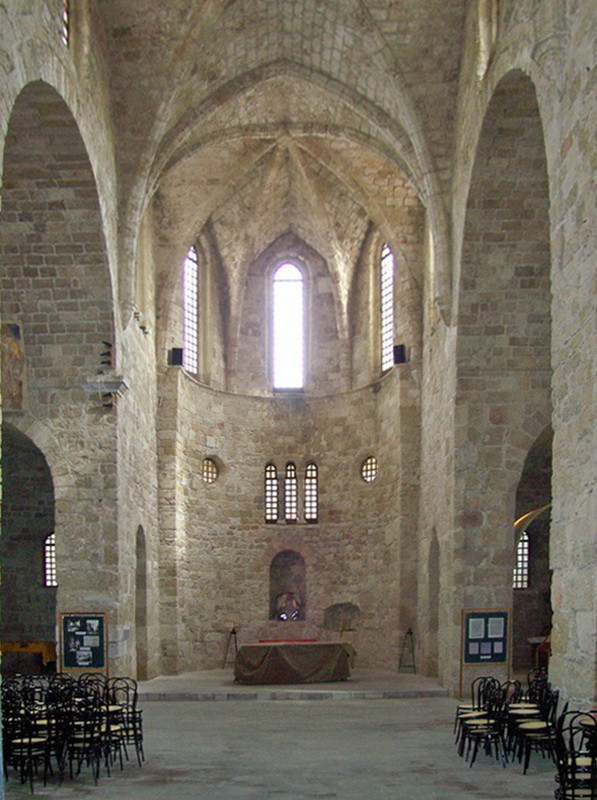 Built in the twelfth century in the form of a Greek cross, this Byzantine church was consecrated in the fifteenth century by the Knights of St. John in the Catholic religion and converted into a Latin cathedral in the Gothic style by which they fortified the bedside, incorporated walls. 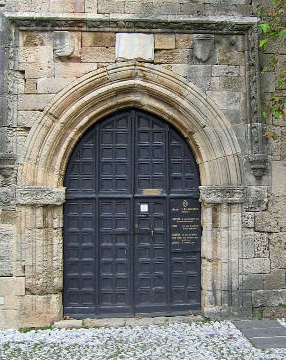 Collachium also located in the church of the Order of St. John of Jerusalem was the Church of St. John and the burial place of the Grand Masters, and was destroyed in the disastrous explosion of 1856. 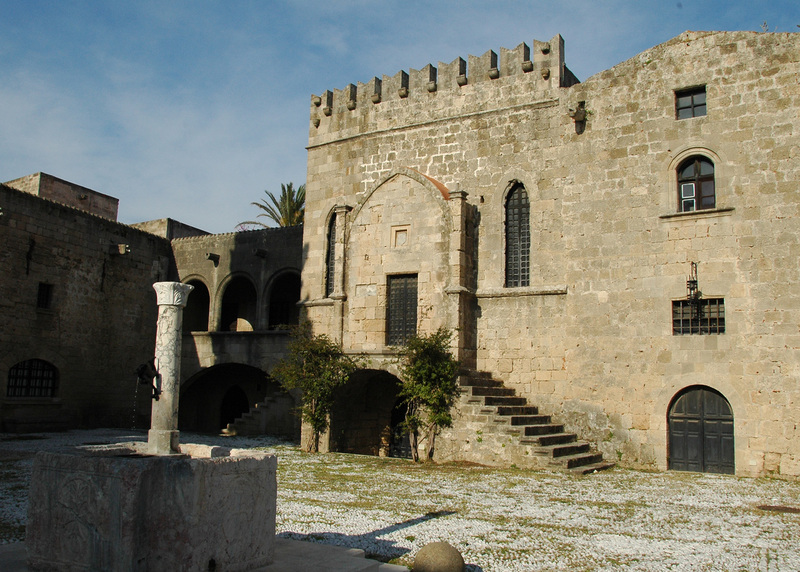 The Church of St. Mary of the Castle was later converted into a mosque (mosque Enterum) the arrival of the Turks in the sixteenth century, the bell tower, which no longer exists, became a minaret. 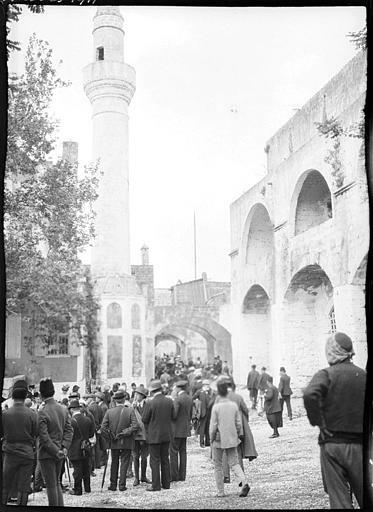 Because of the massacre of Christians perpetrated by the Turks when they arrived, they called the Red Mosque. 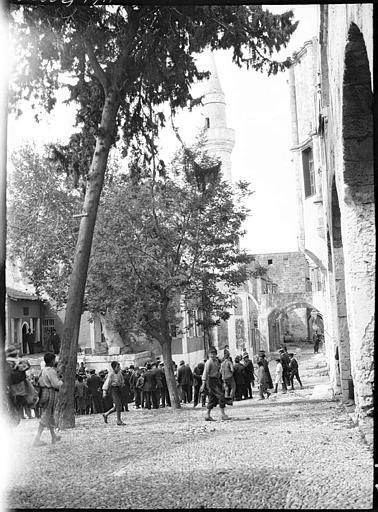 To his right, an old plane, when the Turks hung recalcitrant Christians of the city, shading a small fountain. 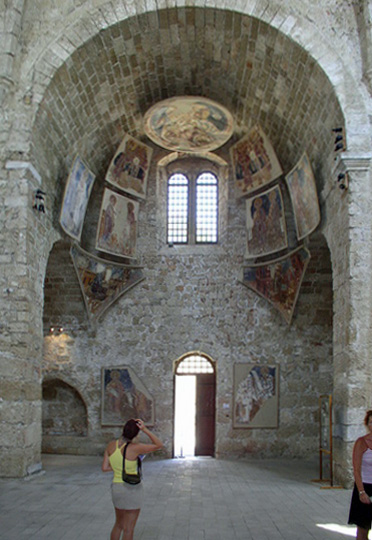 The St Mary’s Cathedral houses the Byzantine Museum . Place Alexander the Great (Plateia Megalou Alexandrou). 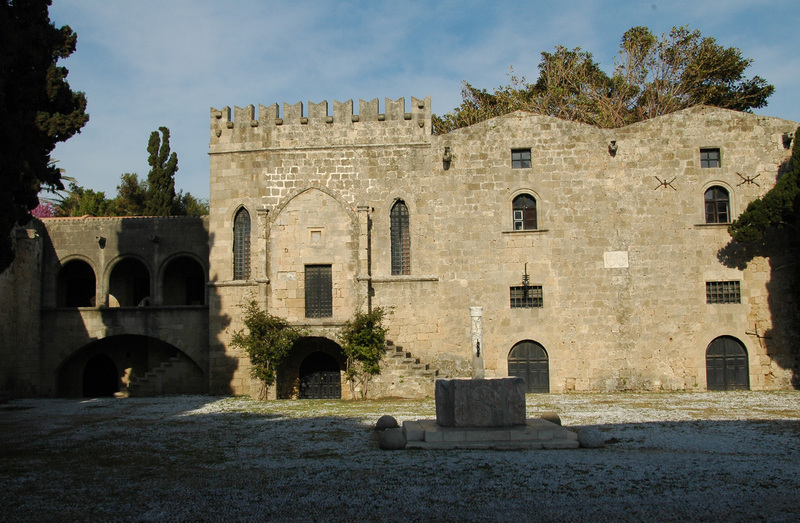 The Museum of Byzantine Art is housed in the medieval church of St. Mary of the Castle . It brings together a remarkable collection of icons from the fifth to the eighteenth century, frescoes, mosaics and paintings of Byzantine from across the Dodecanese. The museum discovers her music and Orthodox chants that give more solemnity instead. Visits every day except Mondays from 8 h 30 to 14 h 30. Entry Fee: € 2. The Inn of England, built in 1483 and now restored, is located away from Knights Street, at the corner of the square opposite the hospital. Rebuilt in 1919 according to the original plans, we see the arms of the country engraved on the front. Behind the inn in England, an alley leads to the door of the Navy and the site Hippocrates . 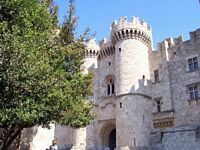 The place of the Hospital, or Museum Square, at the corner of the Rue des Chevaliers stands the imposing building of the Hospital of the Knights . 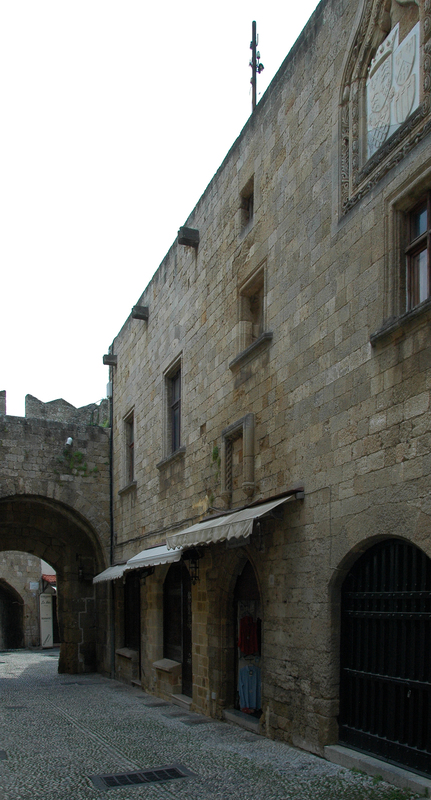 Collachium crossing from side to side, the Street of the Knights up the church of St. Mary of the Castle , at the corner of the Museum Square, to the place of the Palace of the Grand Masters . 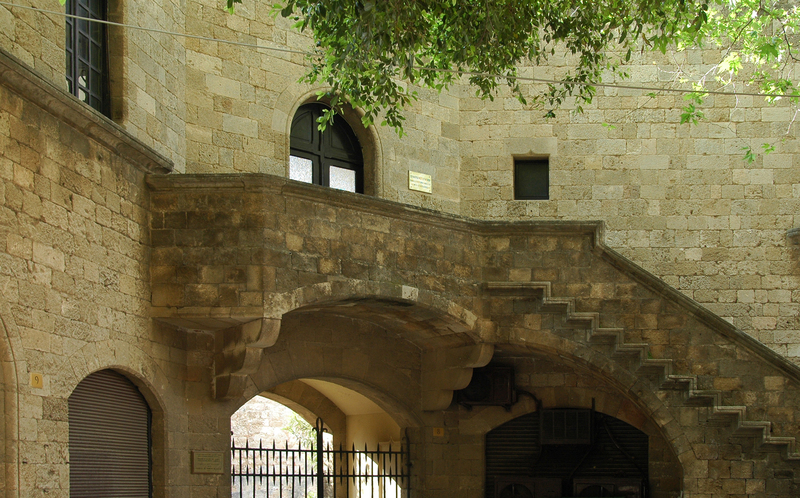 The impressive Grand Master’s Palace occupies a dominant position in the center of the medieval walled City.